APPEARANCE: A kokuri babā is an old hag which inhabits temples deep in the mountains. She hides herself away in the back of the temple and feeds off of human corpses. BEHAVIOR: A kokuri babā was once a priest’s widow at a remote, rural temple. While her husband lived, she was a dutiful wife, helping run the temple, tending to the needs of the parishioners, cooking, cleaning, washing, and taking care of the temple grounds. However, after her husband’s death, she retreated into the temple’s living quarters and became a shut in. When her food stores ran out, she began to steal the offerings left behind by people visiting the temple. 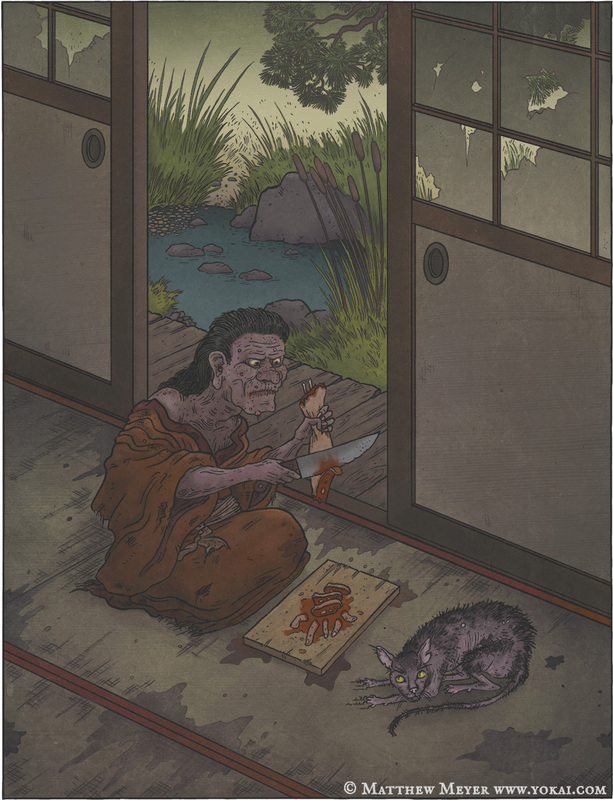 Because of this grave sin, she transformed into a yokai, unable to pass on to the next life. From then on, she developed a taste for human flesh. She survived by carving up meat from the corpses of the recently dead. When there were no fresh corpses available, she would unearth previously buried corpses and peel off chunks of their rotting skin off to gnaw on. 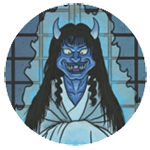 INTERACTIONS: Kokuri babā do not usually interact with people, preferring to stay hidden away in the back rooms of their temples. However, when traveling monks pay a visit to their temple, they do not pass up the chance for some fresh meat. People who encounter a kokuri babā usually realize too late that they are in danger. ORIGIN: Kokuri babā was invented by Toriyama Sekien for his book Konjaku hyakki shūi. Although it is written with words that literally mean “hag of the old temple living quarters,” Sekien was well known for using wordplay in his yōkai names, and this yōkai was no exception. Mukuri kokuri has a long history, originating in the the Mongol invasions of the 13th century. The Mongols under Kublai Khan had conquered China and Korea, and they had set their sights on Japan. The invaders were viewed by most people as the living embodiment of demons. Japan’s victory against the Mongols—thanks in no small part to two typhoons (believed to be kamikaze, or “divine winds” sent from the gods) which eradicated the two major Mongol invasion fleets—ended Mongol expansion and is had a profound impact on the identity of Japan as a nation. The memory of the invasions remained strong for generations, and became a part of folklore. The fear of invading Mongols was the basis for the phrase “Mōko Kōkuri no oni ga kuru” (“The Mongolian-Korean demons are coming!”), which over the centuries was corrupted down to just mukuri kokuri.